London is a city known as much for traditional style as it is for grey skies. As such, outerwear like trench coats are often expected on the runways during this part of international fashion month. For Fall 2017 Fashion Week, British designers instead brought back the sweater and remixed it, giving the functional piece a twist. With unexpected styling and reconstructed form, the sweater took a new shape. Eudon Choi showed chunky knits meant to look half-on, half-off. What better way to show off the great shirt you've got on underneath? 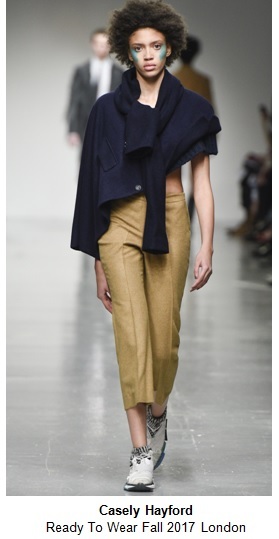 At Casely Hayford, the look was given an athleisure spin: a peacoat/sweater hybrid was paired with trainers. Christopher Kane's alternative ladylike vibe featured a mis-buttoned cardigan with slits mirroring the jaquard skirt. Joseph's oversized sweater with off-center buttons was gorgeously paired with a flouncy calf-length skirt (a winning silhouette). 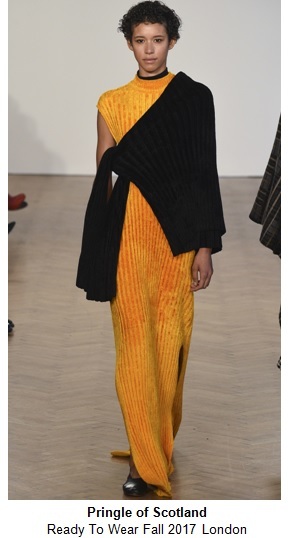 Showing how the look can translate for evening, Pringle of Scotland's golden maxi was styled with a dark knit draped sideways atop one shoulder and tied around the waist. Burberry took the "See-Now-Buy-Now" approach and showed the Spring 2017 collection during this Fashion Week. Seemingly centered around the many ways a sweater can be reconstructed, this runway signaled that you don't have to wait until Fall to start wearing this trend. An easy way to take a shot with this trend is to use a cardigan you already own, buttoning and folding it in a new fashion. Or play with draping and wrapping your favorite oversized sweater. Not only is it a chic way to show off your layers, but you just may find a new silhouette that flatters you and looks fresh.